Shadertoy.com enables artists, programmers, technical artists, and professors from all over the world to create visuals with code, and then share their work while learning from other creators. The website provides a rich code editor, a powerful system of multi-pass rendering, a system to generate sound from code, virtual reality rendering, and a rich set of inputs to use in pieces such as textures, music, and video. Once a piece is submitted, both the animations and the code behind it are available for everybody in the community to explore, tweak, and learn from. The community side of the website allows for people to discover, rate, and discuss the work, making it a great place for learning. Shadertoy was created by Pol Jeremias Vila and Iñigo Quilez. It has been online since February 2013, and more than 85,000 pieces have been submitted by more than 50,000 creators. The contributors come from different backgrounds, such as the arts, game development, academia, and the film industry and represent over 100 different countries. And the best part is that Shadertoy is completely free. Pol Jeremias Vila (ES) lives for real-time graphics. He grew up in Barcelona, but his desire to research and create real-time graphics brought him to California in 2006. After completing his Master’s degree in Computer Science at University of Southern California, he joined LucasArts where he worked on rendering technology for Star Wars 1313, as well as other games. Today, he works at Pixar Animation Studios where he develops rendering algorithms to help the artists make movies. In his spare time, Pol is a co-founder at Shadertoy.com. Iñigo Quilez (ES) started coding fractals and games at age 14. At age 18 he joined the underground community Demoscene where we learnt about the potential of using code and maths to build beauty through real-time rendering. After finishing his MS in Electrical Engineering Iñigo worked in virtual reality and real-time rendering of massive data sets in Belgium. Then he joined Pixar Animation Studios as a technical artist, doing whole production level work and also shot level work. Currently Iñigo works at Facebook as product manager and lead engineer of Quill and the platform’s VR content and distribution efforts. In 2013 he co-founded the website Shadertoy.com together with Pol Jeremias. Both are co-founders at Beautypi. Since the Open Graphics Library known as “OpenGL” was created in the 1990s, 2D and 3D graphic expressions have stepped into a new generation. The beauty of 3D graphic for games, films, and animation have been advancing based on this Open Library Platform for graphic hardware. The animation industry, however, has been struggling with shader, as it requires knowledge of programming, 3D creative platform rendering, and hardware. 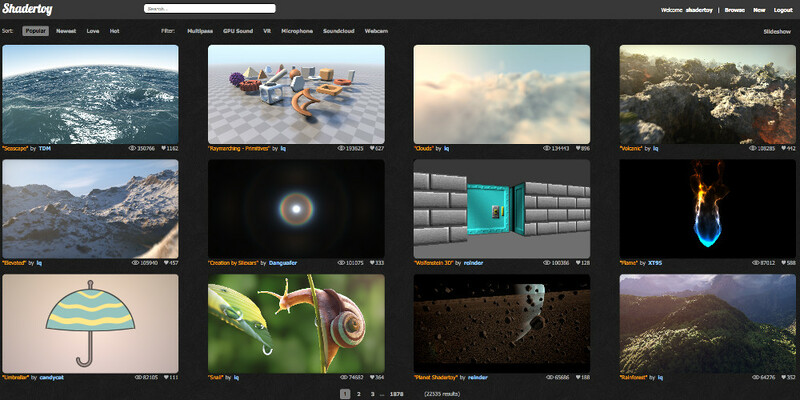 Shadertoy emerged in 2009, dedicated exclusively for WebGL, which has become the main browser based platform for 3D interactive and real-time animation. This open platform for creating and sharing shaders is by and large the next big leap for every creator, student, and educator in the field. The jury felt it was important to recognize the work that has served over 11,000 creators who have contributed their experiments, rendering techniques, and procedural art. Shadertoy is a good example of crowdsourcing and openly sharing creative knowledge that leads to better artworks as well as professional applications.